Long Beach, CA, July 3rd 2018 –Ship & Shore Environmental Inc., a leading U.S. pollution abatement firm, announced today that it will focus its sales and marketing efforts on the fastener industry. As a part of their ongoing 2018 sector diversification strategy as well as the increasing environmental regulations, the company has decided to further strengthen their core industries, including the fastener coating sector. “In a competitive industry such as fastener coating, a key way to differentiate yourself is to provide the highest quality products while reducing the overall environmental impact and operating costs. It is essential to partner with a company that truly knows environmental regulations, has unmatched industry process knowledge, and provides energy-saving solutions that cut costs and increase efficiency. We aim to partner with our fastener customers as a part of their long-term strategy for competitive advantage,” said Anoosheh Oskouian, CEO of Ship & Shore Environmental, Inc.
As an engineering partner, Ship & Shore works closely with fastener companies from the start in order to best design and integrate pollution abatement systems into their current plant design. With a keen understanding of the process, Ship & Shore plans for future expansion as well as potential energy recovery solutions to help with the overall operating costs. J&M Plating is one Ship & Shore’s most distinguished customers in this sector. They provide quality, engineered solutions to the fastener and small stamping industry. 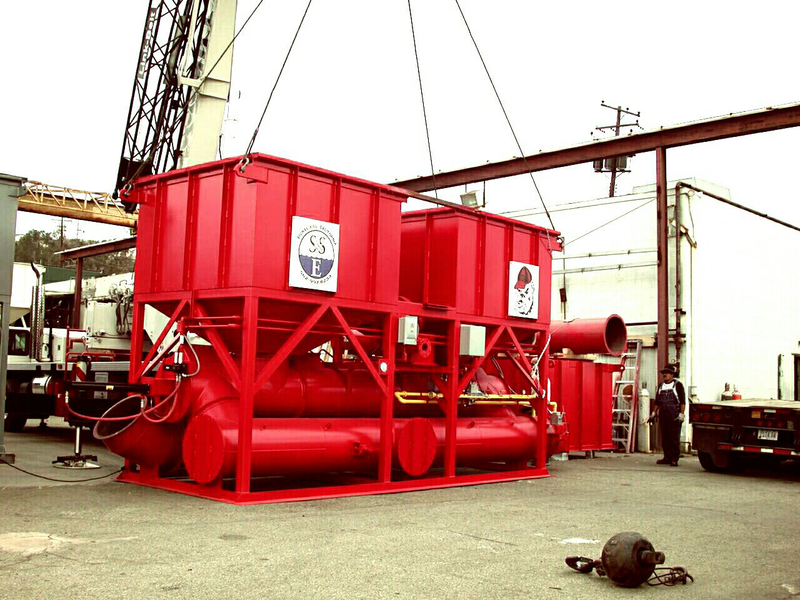 J&M Plating installed a 15,000 SCFM Ship & Shore Regenerative Thermal Oxidizer (RTO) in 2012 and since then, the environmental company has made several improvements to further enhance J&M’s overall plant efficiency. A Permanent Total Enclosure (PTE) was added to capture any fugitive process emissions in their coating application for the RTO to destroy. To re-direct and use the waste heat generated, a heat exchanger was installed in the RTO stack, alleviating negative pressure issues in the compressor room as well as supplying building heat during the winter. Implementing heat recovery options to RTO systems allows fastener companies to reduce energy consumption and utility costs. “Ship & Shore has been servicing J&M Plating since 2012. Their engineers did an excellent job with the installation of our Regenerative Thermal Oxidizer and regularly maintain our equipment. When our air compressor room kept overheating on us, they engineered an airflow system for the room so that we could ventilate that air properly to keep air compressors cool for the summer months. In 2016, they installed a heat recovery system so that we could take waste heat and bring it back into our plant, resulting in significant cost savings. We have had everything tested, and it meets all guidelines for Illinois, which are very similar to California,” explained Mark Morris, owner of J&M Plating. “J&M Plating is a highly valued customer and a great asset in the fastener industry. We look forward to continuing to assist other fastener companies the way we have served Mark and his team,” said Anoosheh Oskouian, CEO of Ship & Shore Environmental, Inc.
Ship & Shore Regenerative Thermal Oxidizers (RTOs) are specifically designed to operate in self-sustaining mode. These systems help companies increase energy and operational efficiency, reduces the harmful effects of process emissions in a safe and controlled environment, and minimizes overall utility consumption. Along with incentive/rebate application assistance by a Ship & Shore engineer, the company is also offering a complimentary energy efficiency assessment for overall plant optimization. These services are aimed to help everyone: manufacturers, the environment, and consumers. For more information about Ship & Shore plant optimization capabilities, consult our website at www.shipandshore.com. Ship & Shore Environmental, Inc. is a Long Beach, Calif.-based woman-owned, certified business specializing in air pollution capture and control systems for industrial applications. Ship & Shore helps major manufacturers meet Volatile Organic Compounds (VOC) abatement challenges by providing customized energy-efficient air pollution abatement systems for various industries, resulting in improved operational efficiency and tailored “green” solutions. Since 2000, Ship & Shore has been prepared to handle and advise on the full spectrum of environmental needs with its complete array of engineering and manufacturing capabilities and multiple offices around the U.S., Canada, Europe and most recently, China. With over 100 specialized professionals spread throughout the world, the company is dedicated to designing tailored solutions for its energy clients. to the fastener and small stamping marketplaces. J&M is certified to the ISO9001:2008 quality standard and their heat-treating and plating laboratories are ISO/IEC 17025:2005 accredited in the area of testing-mechanical. J&M offers heat-treating, dip-spin coating, zinc electroplating, and sorting. For more information, consult www.jmplating.com.